I usually prepare Sundal using this beans. Tried out as a side dish for chapathi and it tasted great. Soak the beans overnight or for 6 hrs. In a cooker, cook the beans with a pinch of salt. Allow it for 3 - 4 whistles. Heat oil in a pan, Add all the seasoning ingredients. Add chopped onions and saute them well. when the onions turn translucent, add the ginger- garlic paste. Then add the chopped tomatoes and saute them well. Add the turmeric powder, chilli powder, garam masala powder, salt .Stir them well on medium flame until the raw flavor extracts from it. Now add the white black eyed beans and potatoes.with a glass of water and bring it to boil. I love black eyed beans sabji with garam garam rotis. This goes well with rice too. A regular treat at home. Your recipe and pic is good. Both karamani and potatoes works out wonder na..lovely and very tempting dish.. I love this recipe. good with rice or rotis.. Perfect colour, texture and masala. Loved it. 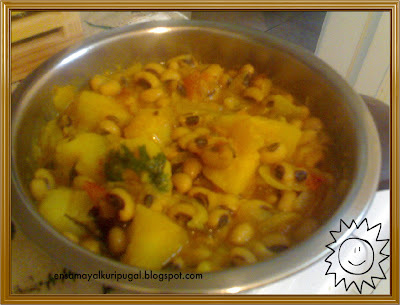 Blackeyed peas and potato subji? 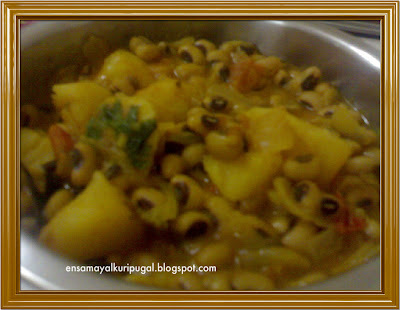 I should try that sometime..I usually make the chole with potato..and it quite boring to eat the same chole.. Thanks for your comments about thiratupal. I am posing recipes now at www.ruchikacooks.com and I have moved from the wordpress blog you saw. Checkout the new one when you are free. Happy Holidays! I prepare this dish often but with aslight variation.Your dish looks delicious. Looks delicious. Perfect with some hot rice! 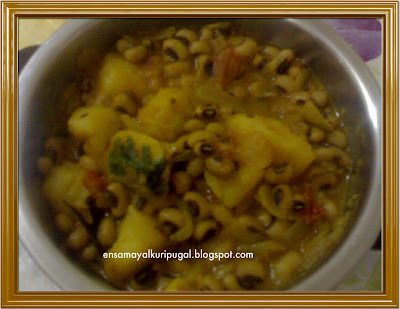 i use to make suNdal, karamani puLi kuzampu. Thats awesome healthy dish..lOoks so yummy. This must be a yummy dish as I love both kaaramani and potato :-). I love black eyed beans..never tried it with potatoes though. Looks delicious!